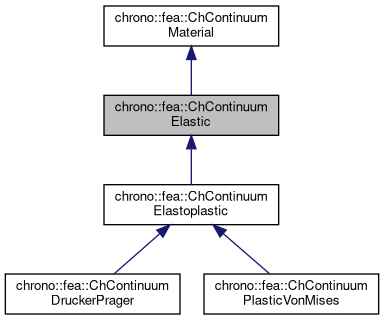 Class for the basic properties of materials in an elastic continuum. This is a base material with isotropic hookean elasticity. Create a continuum isotropic hookean material. Default value for Young elastic modulus is low (like a rubber-type material), and same for density. Set the Young E elastic modulus, in Pa (N/m^2), as the ratio of the uniaxial stress over the uniaxial strain, for hookean materials. Intuitively, the tensile pressure on a side of a parallelepiped in order to double its length. Note that most metal materials require very high values, ex. steel has E=210GPa (E=210e9), aluminium E=69e9, and this can cause numerical problems if you do not set up the simulation integrator properly. Set the shear modulus G, in Pa (N/m^2), as the ratio of shear stress to the shear strain. Setting G also changes Poisson ratio v.
Set the Poisson v ratio, as v=-transverse_strain/axial_strain, so takes into account the 'squeezing' effect of materials that are pulled (so, if zero, when you push the two sizes of a cube, it won't inflate). Most materials have some 0<v<0.5, for example steel has v=0.27..0.30, aluminium v=0.33, rubber=0.49, etc. Note! v=0.5 means perfectly incompressible material, that could give problems with some type of solvers. Setting v also changes G.